As you know, we love cruises in The Jones Family. The kids and I took our first cruise on the Freedom of the Seas. This ship was recently renovated, so we were excited to check it out. We sailed on the Freedom of the Seas out of Port Everglades with stops in Grand Cayman, Costa Maya, and Cozumel. We LOVE this cruise ship, perfect for families and adults. In our videos below, we showcase the must do’s on the Royal Caribbean ship called the Freedom of the Seas. We drove down to Port Everglades in Fort Lauderdale to board the Freedom of the Seas. Our first day included check in, stateroom tour, and heading out to sea. Our 2nd day on the Freedom of the Seas was super exciting. We had breakfast with some of the DreamWorks Characters. This was such a fun breakfast! Today we participated in some of the family cruise activities, including cupcake decorating and volcano making in the Kid’s Club. We arrived to Grand Cayman and parked right next to the Disney Cruise ship. We tendered to Grand Cayman and had a huge surprise. We met Guy Harvey! The Freedom of the Seas has tons of sporting activities, including ice skating at sea and rock climbing. The kids and I hit some of these activities! The kids learned how to ride the Flowrider! It is awesome! We also hit the pool. Today we were at sea! We got to meet Santa and the elves. We also saw some of our favorite DreamWorks characters in a special parade! Today is always a sad day…leaving the ship. Have you thought about a Royal Caribbean Cruise? They are amazing! We loved the Freedom of the Seas and cannot wait to head back to this cruise ship. 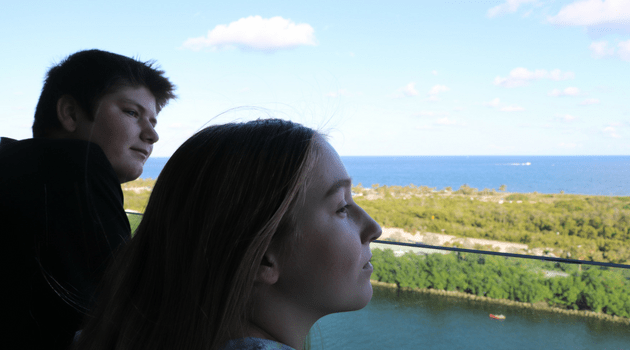 The kids even ranked it as one of their favorite cruises ever! Royal Caribbean Majesty of the Seas Ship Tour! The Royal Caribbean Barbie Experience! Royal Caribbean Freedom of the Seas Cruise Ship!